Can communities and lawmakers stop Indonesian peatfires? On the outskirts of Dompas village in Riau province, a group of men is peeling back the black earth with rhythmic strokes. Armed with hoes, they move slowly in the afternoon sunshine, sliding scores of thick-set seedlings into the ground, one by one. These baby sago palms are being planted on Indonesian peatlands that are degraded, drying and highly vulnerable to fire. 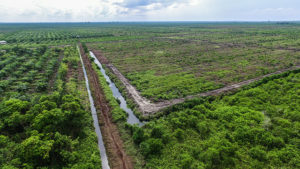 However, the canal that once ran along the edge of this plantation and sapped the site of its water and vital nutrients, has now been transformed into a deep mirror. Blocked by villagers with a series of small concrete dams, it is now feeding resources back into the soil. 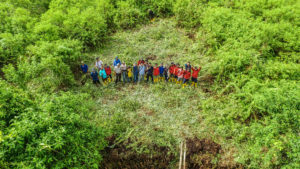 Experts from the Center for International Forestry Research (CIFOR) have been working with the local community for several months, advising on measures to tackle peatland fires. Canal-blocking and crop planting serve important practical purposes. Dried or degraded peatlands are highly flammable due to their high carbon content. They are often set alight by companies and individuals to make way for more financially lucrative palm oil plantations. By encouraging communities to rewet the degraded land by blocking canals and replanting native vegetation that they can sell and eat, a viable economic and environmental alternative is introduced. Aerial view of canal blocking in Dompas, Riau. However, this particular project also serves a wider purpose. It plays a vital role in an investigation by CIFOR into the deeper economic, social and political reasons behind the fires in Riau. New research shows that local elites often control and exploit peatland fires, siphoning off the majority of earned profits. This, combined with complex systems of patronage, lack of law enforcement, and few resources allocated centrally, mean that the Indonesian government’s attempts to address the problem of forest and land fires over the past 18 years have been severely hampered. The study suggests a number of ways to help overcome this stalemate. One of them is to introduce local laws at both district and provincial levels to hold individuals and companies accountable. National laws are often poorly implemented and, up until now, other measures have been largely nonexistent. CIFOR’s consulations on canal-blocking and crop planting are designed to show communities the kind of fire prevention and peatland restoration work that a new law could help fund and enforce. They are also an excellent opportunity for researchers to seek local views on how to stop fires and what measures would be helpful to include in the local laws. The process of developing local laws in Riau first began in February 2016, focusing on two sets of legislation for the district level in Bengkalis and the provincial level in Riau. A large number of concerned parties were consulted – from parliament members to NGOs, academics, farmers, government and the private sector. Each constituency has its own view on what the laws need to address. Local communities asked for provision for fire prevention tools like pumps and water cannons. Others asked for clear prohibitions on burning, for the law to be binding and for it to be tied to the existing national legislation. CIFOR’s research findings on issues like the economic incentives for peatland fires and restoration, de-facto mapping of land at local level and canal blocking and peat restoration costs, also fed into the process. Overwhelmingly, all groups asked for a clear budget to be allocated for fire prevention and restoration work. Complaints ranged from the police saying they do not have the budget to investigate fires to local communities saying they do not have the resources to invest in fire-fighting kits or alternative ways of making a living. The draft laws, incorporating all of these elements, are now with parliamentarians. Purnomo hopes that they will be passed by the end of 2017. Jambi is currently the only province that has comparable legislation. Back in Dompas, even local politicians, the police chief and the provincial parliamentarian have pitched in with the sago palm project. 800 seedlings have been planted in total. However, as long as agricultural land remains more profitable than forest land, and the power structures ruled by local elites maintain an iron grip, huge challenges remain to stopping peatland fires.